Word fit puzzles are a common puzzle type, but it has a large range of names, and keeping up with them is a puzzle in itself! 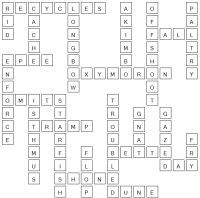 Some of the popular names for word fit puzzles include fill-ins, kriss kross with a 'k' and also criss cross with a 'c'. However, whatever name it is known as, the puzzle is the same! So how to solve a word fit puzzle? Well the aim is very simple - you are presented with a blank grid and a list of words, and you must work out where those words are to be placed in the grid in order to completely fill it, and hence solve the puzzle in the process. There is only one place that each word can fit in a valid solution (eg when all other words are placed) and each word is used exactly once in the solution. The puzzle can be tricky particularly to get started with, depending on the difficulty level, as there are often places where more than one word can fit at a time. If you are presented with such a situation, then you will need to think ahead. Typical solving logic for word fill-in puzzles is 'if this word goes here, what letters does it place in the words that cross it? And are there any words that fit those patterns?' - if the answer is no, then you can reject this word as a possibility as placing it would stop a valid solution existing for the puzzle. It is very uncommon to have to think more than one step ahead in a puzzle, and there is usually a place in the grid where there is only one answer or simple 'what if' logic can be used - although on rare occasions you might need to think more than one step ahead. We hope that you enjoy solving our word fit puzzles, whether you know them as kriss kross or criss cross or any other name for that matter!